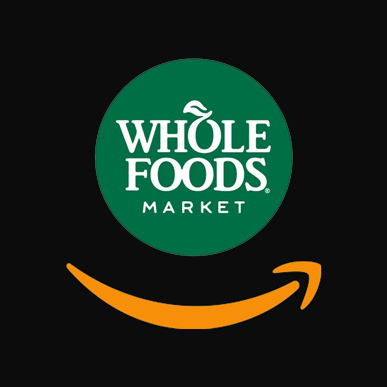 Amazon is blurring the digital and real world, announcing the acquisition of Whole Foods for $13.7 billion dollars. This massive new purchase of a real world retailer indicates the aggressive direction that Amazon CEO, Jeff Bezos, has designed for his company. The acquisition of Whole Foods for $42 dollars a share represents a 27% premium on its closing price yesterday. Whole Foods will continue to operate under its own name and its CEO, John Mackey will continue as such. In the domain universe, we recently parodied the proposed acquisition of Amazon.com by Donuts, Inc.
Corporate mergers typically eliminate jobs, as both parties attempt to restructure functions and processes; in the case of Amazon.com and Whole Foods, it appears that more jobs will be created. Be interesting to see how this impacts the local providers (seafood, produce, meat) from whom WF has historically sourced their products. There’s only so much of that ‘local’ supply that’s available, and scalability isn’t really possible for certain products. So will AMZN have to now own massive farms, meat producers, fleets of fishing boats, etc.? Gene – Great questions. The thing to remember, is that companies like Amazon don’t do this short term. Assuming humanity will be around for a couple more millennia, the idea is for the corporation to prosper for that long.